Jeju (formerly Cheju) is an island province of the Republic of Korea (South Korea) located off the southwestern end of the Korean Peninsula. Dominated by the volcano Halla-san, Korea's tallest mountain at 1947 m (6388 ft), Jeju is roughly 75 km (45 mi) long and 25 km (15 mi) wide. More than half a million people live on the island. The province is divided administratively into two cities, Jeju on the north side and Seogwipo on the south side. 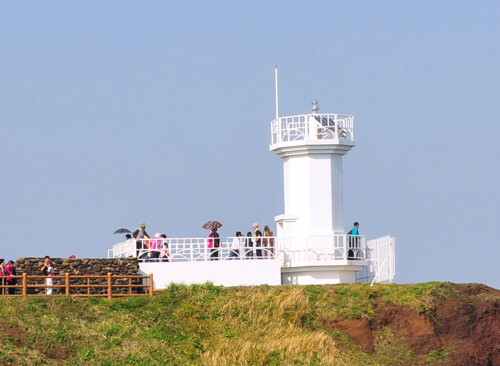 This page has the lighthouses of Seogwipo; those of Jeju City are on a separate page. Jeju is readily accessible by air or by ferry from Busan, Tongyeong, Wando, Mokpo, or Incheon. Following several recent government reorganizations, navigational aids in the ROK are now regulated by the Ministry of Oceans and Fisheries (MOF). 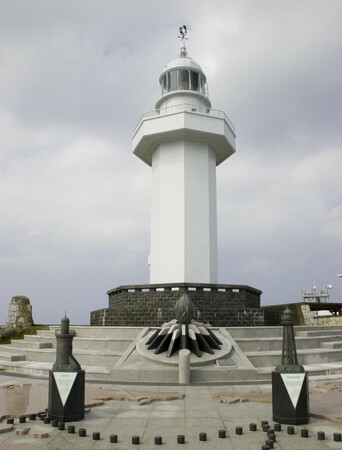 The lights on this page are maintained by the Jeju Maritime Management Division, a branch of the Busan Regional Oceans and Fisheries Administration. Special thanks to Michel Forand, who located many of the photo links on this page. Note: Seongsanpo is a fishing port and ferry terminal at the east end of Jeju. It is named for Seongsan (Sunrise Peak), a rocky headland at the eastern end of Jeju Island popular for its wide view of the sea. Seongsanpo is the port for ferries traveling to Udo Island (see Jeju City). Date unknown. Active; focal plane 15 m (49 ft); two red flashes every 6 s. 20 m (66 ft) tower, painted red, mounted on a round concrete pier. No photo available but Google has a satellite view. Located on a shoal about 1.5 km (1 mi) north of Seongsanpo. Accessible only by boat. Site open, tower closed. Admiralty M4272.25; NGA 17429. Date unknown. Active; focal plane 12 m (39 ft); red flash every 5 s. 11 m (36 ft) round cylindrical concrete tower with lantern and gallery. Entire lighthouse is yellow (NGA lists the tower as red). Kim Cheol Bong has a closeup photo, this light is at the lower center of the photo at right, and Google has a satellite view. Located at the end of the east breakwater of Seongsanpo. Site status unknown. Admiralty M4272.42; NGA 17432. Date unknown. Active; focal plane 16 m (52 ft); two green flashes every 6 s. 15 m (49 ft) round cylindrical concrete tower with lantern and gallery. Entire lighthouse is yellow (NGA lists the tower as red). Kim Cheol Bong has a closeup photo, this light is at the right side of the photo at right, and Google has a satellite view. 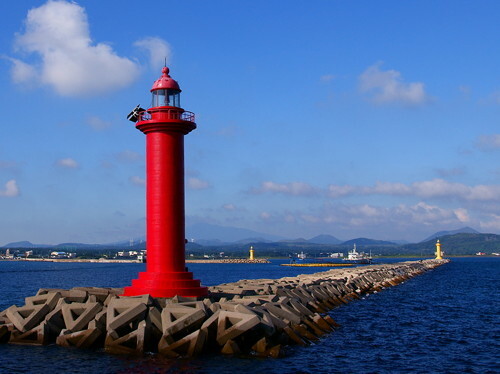 Located at the west end of the detached main breakwater of Seongsanpo. Accessible only by boat. Site and tower closed. Admiralty M4272.36; NGA 17435. Date unknown. Active; focal plane 16 m (52 ft); two red flashes every 6 s. 15 m (49 ft) round cylindrical concrete tower with lantern and gallery, painted red. A photo is at right, Kim Cheol Bong has a closeup photo, another photo is available, and Google has a satellite view. Located at the east end of the detached main breakwater of Seongsanpo. Accessible only by boat. Site and tower closed. Admiralty M4272.35; NGA 17434. Date unknown. Active; focal plane 17 m (56 ft); green flash every 4 s. 15 m (49 ft) round cylindrical concrete tower with lantern and gallery, painted white. Kim Cheol Bong has a closeup photo, Jerry Baker has a second closeup, there's a view from the sea, and Google has a satellite view. Located at the east end of the detached main breakwater of Seongsanpo. Accessible only by boat. Site and tower closed. Admiralty M4272.3; NGA 17424. Date unknown. Active; focal plane 40 m (141 ft); white flash every 4 s. 12 m (39 ft) octagonal cylindrical concrete tower with gallery, painted white. A photo is at right, a 2016 photo is available, Jay Bek's photo shows the long flight of stairs leading to the lighthouse, Choi Jae-pil has a street view, and Google has a satellite view. 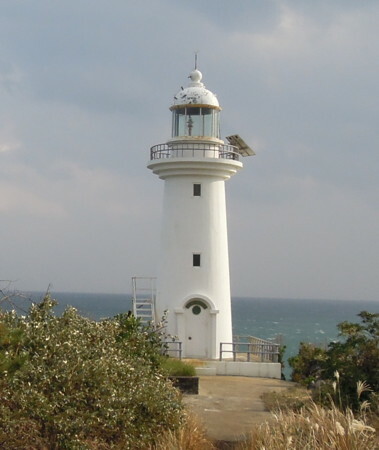 Offering a wide view of the Korea Strait, this lighthouse is a popular observation point. Located on a promontory at the southeastern tip of Jeju, about 3 km (2 mi) southeast of Tongnam. Site open, tower closed. Admiralty M4272.5; NGA 17436. 1906. Inactive. 4 m (13 ft) square basalt rubblestone tower. A photo and a second photo are available, Google has a street view, and Bing has a satellite view. Small traditional stone lightstands of this kind, called daetbul, are found at many small Korean harbors. This is one of the larger examples. Located on the waterfront of Onpyeong. Site open, tower closed. Date unknown. Active; focal plane 14 m (46 ft); three quick white flashes every 10 s. 13 m (43 ft) round cylindrical concrete tower with gallery, painted black with one yellow horizontal band. A photo is available, and Google has a satellite view and a distant street view from shore. Located on a shoal off a promontory on the southeast coast of Jeju, about 1.2 km (3/4 mi) southeast of Onpyeong. Accessible only by boat. Site open, tower closed. Admiralty M4272.54; NGA 17440. Date unknown. Active; focal plane 12 m (39 ft); green flash every 4 s. 9 m (30 ft) round cylindrical white concrete tower. A photo and a second photo are available, and Google has an indistinct satellite view. Located on the east breakwater of Pyoseon, a small port about 15 km (9 mi) southwest of Pangdupo. Accessible by walking the pier. Site open, tower closed. Admiralty M4272.57; NGA 17448. Date unknown. Active; focal plane 14 m (46 ft); white flash every 5 s. 7 m (23 ft) octagonal cylindrical white concrete tower with gallery. Tim Wang's photo is at right and Google has a street view and a satellite view. The present tower appears taller than the one described by the light lists. Located on a promontory about 800 m (1/2 mi) south of Pyoseon Hang. Site open, and visitors can climb atop the base of the tower; tower closed. Admiralty M4272.6; NGA 17444. Date unknown. Active; focal plane 16 m (52 ft); white flash every 9 s. 6.5 m (21 ft) round cylindrical concrete tower with upper and lower galleries, painted white. A foggy photo is available, and Google has a street view and a satellite view. NGA lists a small skeletal tower at this location. Located on a promontory on the east side of Taemeung Hang, a harbor about 16 km (10 mi) east of Seogwipo. Site open, tower closed. Admiralty M4272.7; NGA 17452. Date unknown. Active; focal plane 13 m (43 ft); white flash every 6 s. 12 m (39 ft) octagonal cylindrical concrete tower with gallery. Entire lighthouse is white. A photo (just over halfway down the page) is available, and Bing has a satellite view. Located at the foot of a steep headland about 25 km (15 mi) east of Seogwipo harbor. Site status unknown. Admiralty M4272.75; NGA 17454. Date unknown. Active; focal plane 17 m (56 ft); six quick white flashes and one long white flash every 15 s. 22 m (72 ft) round concrete tower, upper half painted yellow and lower half black. A photo (1/4 the way down the page) is available, and Google has a satellite view and a distant street view from shore. Located on an offshore reef about 6.5 km (4 mi) east of Wimi Hang. Accessible only by boat, although there should be a good view from shore. Site open, tower closed. Admiralty M4272.78; NGA 17454.5. Date unknown. Inactive since 2017 (listed by NGA with focal plane 18 m (59 ft); red flash every 6 s). 10 m (33 ft) round cylindrical concrete tower, painted red. A closeup photo and several other photos (1/3 the way down the page) are available, and Google has a satellite view and a distant street view. Located at the end of the east breakwater at Wimi Hang, a harbor about 12 km (7.5 mi) east of Seogwipo. Accessible by walking the pier. Site open, tower closed. ex-Admiralty M4272.9; NGA 17455. Date unknown. Active; focal plane 13 m (43 ft); green flash every 6 s. 10 m (33 ft) round cylindrical concrete tower, painted red. Several photos (1/3 the way down the page) are available, and Google has a satellite view and a distant street view. Located at the end of the west breakwater at Wimi Hang. Accessible by walking the pier. Site open, tower closed. Admiralty M4272.95; NGA 17455.5. Date unknown. Active; focal plane 17 m (56 ft); white flash every 5 s. 12 m (39 ft) round cylindrical concrete tower, painted white. A closeup photo, a second photo and a more distant view are available, and Google has a satellite view. Chigwi Do is a small island about 5 km (3 mi) south of Wimi Hang. Located on the north side of the island. Site status unknown. Admiralty M4272.8; NGA 17456. 2013. Active; focal plane 18 m (59 ft); two red flashes every 6 s. 15 m (49 ft) round concrete tower with lantern and gallery. Entire lighthouse is red. The light is at the left in Sangik Han's photo, Brian Wolff has a street view, and Google has a satellite view. Located on the north breakwater at Hahyo harbor. Accessible by walking the pier. Site open, tower closed. Admiralty M4272.955. 2013. Active; focal plane 18 m (59 ft); two red flashes every 6 s. 12 m (39 ft) round concrete tower with lantern and gallery. Entire lighthouse is white. The light is at the left in Sangik Han's photo, Brian Wolff has a street view from the north breakwater, and Google has a satellite view. 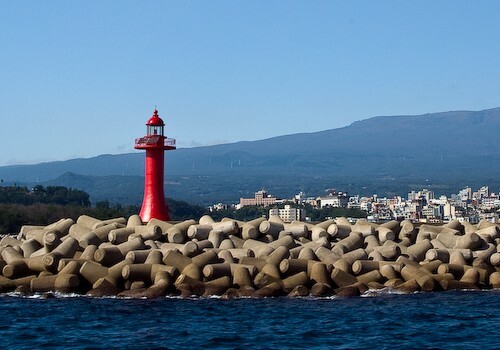 Located on the detached south breakwater at Hahyo harbor. Site open, tower closed. Admiralty M4272.958. Date unknown. Active; focal plane 17 m (56 ft); red flash every 4 s. 15 m (49 ft) round concrete tower with lantern and gallery. Entire lighthouse is red. Michael Sotnikov's photo is at right, a view from the sea is available, and Google has a good satellite view. Located at the end of the main (east) breakwater of Seogwipo. Accessible by walking the pier. Site open, tower closed. Admiralty M4274.505; NGA 17467. Date unknown. Inactive since 2014. 15 m (49 ft) round cylindrical concrete tower with lantern and gallery. Entire lighthouse is white. Baek Seung Hwa has a photo, another photo is available, Seung Gon Baek has a sea view, and Google has a satellite view. This is a relatively new light; the present south breakwater was not built until sometime after 2006. Located at the end of the south (really west) breakwater of Seogwipo. Probably accessible by walking the pier. Site open, tower closed. ex-Admiralty M4274.2; ex-NGA 17462. Date unknown. Active; focal plane 96 m (315 ft); white flash every 6 s. 9 m (30 ft) round white concrete tower. No photo available but Google has an indistinct satellite view. Located atop the east end of Moonseom, a small but high island 500 m (0.3 mi) south of the Seogwipo harbor entrance. Accessible only by boat. Site status unknown. Admiralty M4273; NGA 17468. Date unknown. Active; focal plane about 15 m (49 ft); red light, characteristic unknown. Approx. 13 m (43 ft) round cylindrical concrete tower with lantern and gallery. Entire lighthouse is red. A distant view is available and Google has a satellite view. Daecheon is an industrial town and harbor about 8 km (5 mi) west of Seogwipo. Located at the end of the east breakwater of Daecheon harbor. Site status unknown. Admiralty M4274.523. Date unknown. Active; focal plane about 15 m (49 ft); green light, characteristic unknown. Approx. 13 m (43 ft) round cylindrical concrete tower with lantern and gallery. Entire lighthouse is white. No photo available but Google has a satellite view. Located at the end of the east breakwater of Daecheon harbor. Site status unknown. Admiralty M4274.522. Date unknown. Active; focal plane 19 m (62 ft); three quick white flashes every 10 s. 22 m (72 ft) round concrete tower with gallery, painted black with one yellow horizontal band. A photo (sixth photo on the page) probably shows this lighthouse and Google has a good satellite view. Located on a rock just west of Daecheon harbor. Accessible only by boat. Site open, tower closed. Admiralty M4274.55; NGA 17476.1. Date unknown. Active; focal plane 22 m (72 ft); white flash every 7 s. 12 m (39 ft) round white concrete tower with lantern and gallery. M.C. Han's photo is at the top of this page, Kanji Shinohara has a closeup photo, and Google has a street view and a satellite view. Located on a sharp promontory sheltering a small harbor about 20 km (13 mi) west of Seogwipo. Site open, tower closed. Admiralty M4274.58; NGA 17477. Date unknown. Active; focal plane 16 m (52 ft); red flash every 6 s. 13 m (43 ft) round cylindrical concrete tower with lantern and gallery, painted red. A closeup photo and a distant view are available, and Bing has a satellite view. 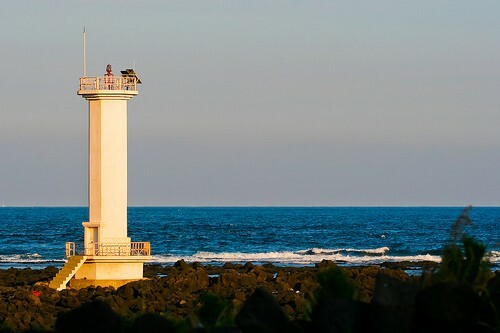 Located at the end of the main (east) breakwater of Sagye, a small port about 4 km (2.5 mi) west of Hwasun near the southwestern point of Jeju. Site status unknown. Admiralty M4254.8; NGA 17490. 1987 (station established 1915). Active; focal plane 51 m (167 ft); white flash every 10 s. 16 m (52 ft) octagonal cylindrical concrete tower with lantern and gallery. Entire lighthouse is white. 2-story crew building and other light station buildings. A photo is at right, JungHwan Choi has another photo, and Google has a street view and a satellite view. Marado is a small island about 7 km (4.5 mi) south of the southwestern point of Jeju. The island is accessible by a daily ferry from Moseulpo. Located atop a vertical cliff on the eastern side of the island. Accessible only by boat. Site open, tower closed. ARLHS SKR-016; Admiralty M4254; NGA 17480. Date unknown. Active; focal plane 15 m (49 ft); two white flashes every 5 s. 11 m (36 ft) round concrete tower, painted black with one red horizontal band. A photo is available and Bing has a satellite view. Located on a reef about 3 km (2 mi) south of the southwestern point of Jeju and about 1.5 km (1 mi) east of Gapado, an island midway between Marado and the mainland. Accessible only by boat. Site open, tower closed. Admiralty M4254.3; NGA 17483. Date unknown. Active; focal plane 17 m (56 ft); six quick white flashes followed by one long white flash every 15 s. 22 m (72 ft) concrete post mounted on a concrete pier. Upper half of the lighthouse painted yellow, lower half black. No photo available. Located about 400 m (1/4 mi) southeast of the southern point of Gapado.Accessible only by boat. Site open, tower closed. Admiralty M4254.15. Date unknown (station established 1998). Active; focal plane 16 m (52 ft); two white flashes every 10 s. 19 m (62 ft) round metal tower, painted black with one red horizontal band. No photo available and the light is not seen in Bing's satellite view of the listed location. From various sources it appears that lights here have been repeatedly destroyed or damaged by typhoons and other storms. Located on a reef about 3 km (2 mi) southwest of the southwestern point of Jeju. Accessible only by boat. Site open, tower closed. Admiralty M4254.35; NGA 17483.5. Date unknown. Active; focal plane about 16 m (52 ft); two green flashes every 6 s. 11 m (36 ft) round tapered concrete tower with lantern and gallery. Entire lighthouse is white. Hyun-seok Jun has a closeup night time street view and Google has an indistinct satellite view. Located at the end of the breakwater of the new south harbor of Moseulpo. Accessible by walking the pier. Site open, tower closed. Admiralty M4254.355. Date unknown. Active; focal plane 15 m (49 ft); red flash every 5 s. 10 m (33 ft) round cylindrical concrete tower, painted red. Choi Gwang Shin has a closeup photo, SeungHun Song has a view from the sea and Google has a satellite view. Mosulpo is the terminal for ferries to Mara-do. Located at the end of the east breakwater at Moseulpo Hang, a harbor about 3 km (2 mi) northwest of the southwestern corner of Jeju. Site status unknown. Admiralty M4254.6; NGA 17484. Date unknown. Active; focal plane 17 m (56 ft); green flash every 5 s. 10 m (33 ft) round cylindrical concrete tower, painted white. SeungHun Song has a closeup photo, Wai Tong Ho has a photo of the light in action, Jeong Seong Hun has a view of both breakwater lights from inside the harbor, and Google has a satellite view. Located at the end of the west breakwater at Moseulpo Hang. Site status unknown. Admiralty M4254.4; NGA 17488. Date unknown (station established 2001). Active; focal plane 37 m (121 ft); two short white flashes followed by a long white flash (Morse Code "U") every 15 s. Fog horn (three blasts in the same "U" pattern every 30 s). Light mounted on a square platform supporting a helipad and solar-powered research station. A photo is at right and another photo is available. Socotra Rock is a submerged reef in the East China Sea 149 km (93 mi) southwest of Jeju. At low tide the reef is 4.6 m (15 ft) below sea level. Both South Korea and China claim this patch of the ocean for their exclusive economic zones. 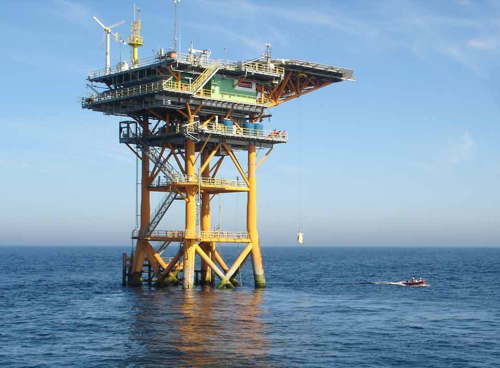 The platform was built by Korea between 1995 and 2001; it carries the automated Ieodo Ocean Research Station. Accessible only by boat. Site open, tower closed. Admiralty M4252; NGA 17481. Posted December 10, 2007. Checked and revised December 25, 2018. Lighthouses: 34. Site copyright 2018 Russ Rowlett and the University of North Carolina at Chapel Hill.